"The Memorist is the kind of big, ambitious book that doesn’t fit into the cookie-cutter shape of the typical thriller. Rose’s stylistic mastery is exceeded only by her exhaustive research, the two combining to create a starkly original and brilliantly conceived tale." "I don't believe in [reincarnation] but I do believe in good writing, and Rose is an unusually skillful storyteller. Her polished prose and intricate plot will grip even the most skeptical reader. Whatever your views on reincarnation, The Memoirist is first-rate fiction." "Rose tells an ambitious story with The Memorist, a fast-paced tale of suspense torn between two different time periods. Few authors would have the moxie to attempt such a daring story, but Rose pulls it off." "Rose tells [the story] elegantly moving gracefully between characters, between time and place, and building both momentum and suspense ... recommended highly to readers who appreciate mysteries tinged with the supernatural." "Rose's fascinating follow up to The Reincarnationist…skillfully blends past life mysteries with present day chills. The result is a smashing good read." "I do not believe in reincarnation, but I do believe in this writer's ability to make you want to believe. This is the page-turner-you-cannot-go-to-sleep-till-it's-finished thriller of the year. I love Ludwig Van Beethoven, and now I love M.J. Rose's THE MEMORIST." - Sheldon McArthur, NORTH BY NORTHWEST BOOKS, FOUNDER OF THE MYSTERY BOOKSHOP LOS ANGELES. "All in time. All in time. All in time." The phrase repeats metronomically at one point in M.J. Rose's THE MEMORIST, reminding us that time really is everything, particularly in this accomplished follow-up to THE REINCARNATIONIST. Past and present do more than interweave in these pages; they wage fierce battles for primacy in the lives of the characters. Rose has crafted an intricate story that explores the mystical, emotional, political, and historical threads connecting a mysterious flute linked to Beethoven, a clandestine reincarnationist society, and the more contemporary horrors of international terrorism. 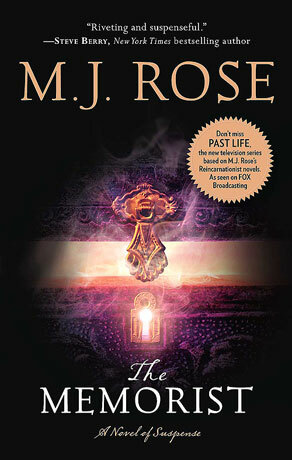 M.J. Rose does it again with THE MEMORIST another breathtaking thriller from the prolific best-selling author of THE REINCARNATIONIST. In this engrossing novel Rose interweaves a multiplicity of themes involving a quest to resolve issues from the past, the music of Beethoven, a secret society and the threats of terrorism. Only M.J. Rose could bring these plot strands together for a credibly incredible denouement. For a memorable read, experience THE MEMORIST. - Buy THE MEMORIST from this bookseller, click here.